It is still too soon to know the economic impacts. The fire danger continues and the fatality and property damage reports are still coming in. But I have started to think about the nature of the potential losses to the wine industry. As Tom Wark wrote last week, we need to think about what happens when the fires are finally out, even if that’s not the most important immediate concern. Here is what I am thinking now. The direct impact of the wildfires on California wine will very unevenly distributed, because that’s how a wildfire works, but the indirect effects are likely to be even larger and widespread. It is important to get out the message that California wine is open for business. The North Coast region (Napa, Sonoma, Mendocino, and Lake counties) is very important in terms of the value of the wine it produces, but is dwarfed by Central Valley production in terms of volume. The huge quantities of California appellation wines that fill the nation’s retail shelves will not be much affected by the wildfires. This is important to realize since some press reports link the wildfires to the tight global wine market that has resulted from poor harvests in Europe this year, which risks giving a false impression about wine supplies in California. While some North Coast vineyards and wineries lost everything, others suffered little or no direct damage to cellar, vineyard, or wine stocks. The floor of the Napa Valley, for example, is not much damaged so far. But that doesn’t mean that wineries without direct damage won’t suffer an economic loss. No way to put a dollar and cents figure on the direct losses until individual assessments of winery destruction, vineyard damage, loss to stored wines, possible smoke taint issues, and so forth are made. But we can already see the indirect cost in one area: tourism. Wine tourism is incredibly important to Napa and Sonoma these days, both for the high-margin direct sales that wineries there increasingly rely upon to compensate for escalating grape costs and for the hospitality industry that has grown up to serve wine tourists. The economic impact of wine tourism is very large for the region. On a typical day in 2016, according to the latest Napa tourism economic impact study, there were almost 17,000 tourist in the Napa Valley who spend more than $5 million. These are not typical days and the income and jobs those numbers represent are nowhere to be seen for now. The wildfires have obviously interrupted wine tourism even for wineries that are not directly affected by the fires and it is not clear how soon anything like a normal tourist flow will return. This is complicated by a number of factors including the perception that the whole region is badly burnt and therefore closed for business, damage to transportation and hospitality infrastructure, and problems for the workers who support both the wine and hospitality industries. Many of the workers who live in the region are dealing with personal losses or are busy helping those in need. The hundreds of workers who live outside the local area and commute to jobs in Napa face obviously obvious obstacles, too. In the short term I am told that it is actually the shortage of staff more than the direct impacts of the fires that limits winery operations in many cases. The bottom line is that while the direct damage from the firestorm is large but unevenly distributed, the indirect costs are likely to be even bigger and affect almost everyone in the region, wine people and non-wine folks, too. It is not entirely clear what normal will look like when the smoke clears and it will take some time to find out. But, as Tom Wark writes, Napa Stands Strong (and Sonoma, too) and it is important to press ahead. The videos I have seen of the fire damage bring to mind scenes of burning Napa vineyards that appear in a wonderful 1942 book by Alice Tisdale Hobart called The Cup and the Sword (which was made into a terrible 1959 film called This Earth is Mine starring Rock Hudson and Jean Simmons and set in Napa and Sonoma). Hobart’s novel is about the resilience of the strong women and men who built the California wine industry and the vineyard fire signifies rebirth from the ashes because, with some effort and care, the sturdy vines in the novel do come back to life. It is an image to keep in mind today when recovery, rebuilding, and rebirth are on our minds once again. The monument to Christopher Columbus at the foot of the Las Ramblas promenade must be one of the most-viewed sights in very scenic Barcelona. Standing atop his tall column, Columbus points to the sea, an act that makes sense both for Columbus himself and for Barcelona, a city that has long turned its face to the sea and to the international influences that it provides. Columbus points to the sea — that’s what people think he is doing. But I have another, somewhat less literal theory. I think that he is really pointing, in a vague and perhaps somewhat misguided fashion, away from Barcelona’s bright city lights and toward the not-too-distant vineyards — to the Penedés and Priorat wine regions. Tourists, he is saying, you need to visit wineries and learn about Spanish wine! My evidence? Wishful thinking, of course (reinforced by a poor sense of direction), but more significantly this fact: if you walk down the stairs in the base of the Columbus’s column you will find not a maritime museum as you might expect but a wine tourism center, there established to help you enjoy winery visits in this region. Visitors to Barcelona really should make time to visit wineries — and many thousands of them do. Columbus was busy during our visit, so we relied upon FEV, the Spanish Wine Federation, to organize our itinerary. Here are three case studies that show different sides of wine tourism in this part of Spain. History is an important part of any visit to Codorníu-Raventos. Josep Ravenos was the first to make a Spanish sparkling wine using the traditional method and it is a leading producer of Cava wine today. Codorní receives about 80,000 guests each year and most of them begin their visit in the extravagant arte nouveau hall that you see here (the exterior architecture is just as fascinating and unique). The tour makes good use of the beautiful gardens, which hold many delights including a fascinating wine museum in another striking arte nouveau building. We met with the head winemaker, who was excited help us understand Cava today and to show us the lab where he experiments with micro-fermentations in a constant effort to raise quality and draw out new expressions of Cava. It was an intense and fascinating visit. The architecture is distinctive and historic at Freixenet, but what’s inside the building (and underground, too) was more the point here. We walked down, down, down — deep underground — to the miles of tunnels where Cava was stored for second-fermentation in the bottle for many years. Like most of the 90,000 visitors who come here each year, Sue and I boarded a small train to tour the tunnels — if you have visited Champagne you may have taken a similar ride there. One of our stops was at the yeast lab — Freixenet believes that their distinctive yeast variety is one key to the unique quality of their wines and so they put much effort into yeast research. Fascinating. A special tasting was set for us with Pedro Bonet, head of the Freixenet winery family and President of the Cava DO. The goal of the exercise was to show us the enormous diversity of Cava and it was an eye-opening experience. Cava isn’t one thing or two, but a whole spectrum of tastes and aromas. Delicious! Both Cava winery visits impressed us with the fact that while Cava is a product that uses traditional winemaking techniques, it is also constantly changing both to improve quality, develop new expressions of the wine, and to achieve more efficient production. The market for sparkling wines is very competitive — both among Spanish producers and between them and international rivals. Robots and machines now replace workers where possible for routine jobs, freeing human creativity for higher tasks. There was much more to see and do at Freixenet, but we had to move on. Lunch was waiting at our next stop! One of the brochures we found at the wine tourist center at the base of the Columbus monument was for Miguel Torres. “Wine Day at Torres Winery” presents a number of options for Barcelona tourists including a seven hour guided bus tour with stops at Torres, Jean Leon and Saint Sadurni d’Anoia wineries for €71 (children under 8 ride free) or an 8 hour guided bus tour with stops at Torres, Montserrat (with tastings of traditional liqueurs), and a tour of scenic Stiges for €63. Not everyone likes a bus tour so train and auto options are also on offer. 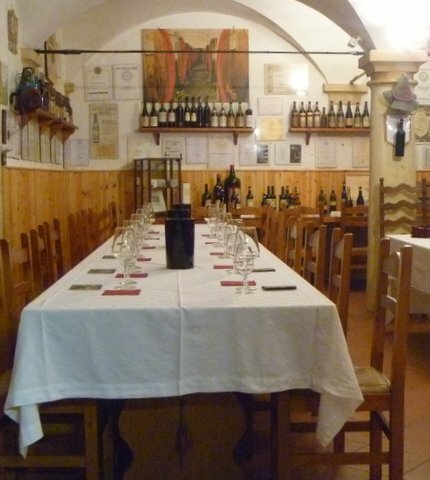 Take the train from Barcelona to Vilfranca del Penendés, for example, then a shuttle to the nearby Torres winery for a visit, tasting, and return trip with a tour of the scenic village. The trip lasts about 5 hours and costs just €15. I think it would be very pleasant way to spend a day riding the train, seeing the countryside and enjoying the wine experience, too. There are many options for Torres wine tourists with their own transportation, which you can view at the Club Torres website. Our tour of Torres began with lunch at the winery’s Restaurant Mas Rabell, which features a daily set menu of traditional cuisine paired with Torres wines, of course. What a great way to taste the wines! We enjoyed chatting with Miguel Torres, who had attended my FEV talk in Valladolid and asked the toughest questions. Then we toured the Mas La Plana vineyard and winery with a winemaker. The vineyard, planted to Cabernet Sauvignon vines, redefined the idea of wine in this region and the Mas La Plana wine, which has its own winery, raised the bar, too. The tour stressed quality, innovation, and sustainability. Torres, Freixenet and Codorníu are three case studies of wineries that have invested in wine tourism and are gaining the benefits, both for themselves and their communities. They are great role models for other ventures around the world. Goodbye Columbus and Barcelona, too. Sue and I loved visiting the city and learned a lot at our winery visits. Thanks to everyone we met for their kindness and hospitality. Wine tourism is no longer about just selling wine. Wineries understand that it is a way to build or strengthen a brand and to create brand ambassadors. 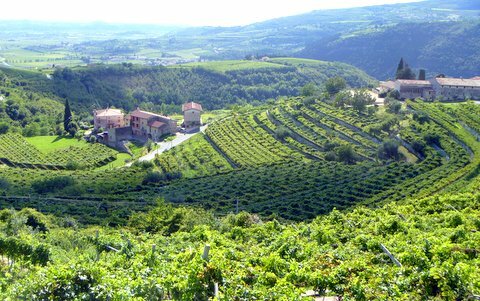 The United Nations World Tourism Organization Wine Tourism initiative goes further . The UNWTO proposes that wine tourism is or can be a set of rich experiences that use wine to connect history, culture, tradition, and cuisine in a way that links the global tourism market to distinctive local environments. The best wine tourism experiences, like the best tourism experiences generally, surprise, delight, inform and sometimes inspire and transform. That’s a powerful force. I guess that’s why wine tourism is one of the fastest growing segments of the wine industry. Sue and I encountered several state-of-the-art wine tourism programs during our recent FEV-sponsored visit to Spain. Here are sketches of three of the most memorable to give you a sense of what’s on offer in this dynamic wine nation. Come back next week for three more case studies. You travel to Morales de Toro by passing through acre after acre of century-old goblet-trained Tinto de Toro (the local variety of Tempranillo) vines. What a sight! When you get there you are drawn to the Pagos Del Rey Wine Museum, which is located in the building that once housed the local cooperative winery and radiates the sense of its utilitarian origins. Most of the wine museums I have experienced are built around collections of old equipment, and this is true here as well. Both the garden and the museum itself have these displays. What gets your attention, however, is the main hall, which features the double row of concrete tanks (see photo above) that was the hard-working part of the winery. Interactive exhibits stand between the rows, but the real fun begins when you round the corner and enter the first tank. A video kicks on a you quickly realize that you are actually in the tank as the grapes are loaded in and fermentation takes place over and around you (interrupted by periodic pump-overs). Each of the other tanks presents its own video that explains the vineyard and winery process until you reach the end, which immerses you in the local harvest festival. This might be the most interesting wine museum we’ve ever visited in the way that all the senses are engaged and linked to both the wines but also local culture and tradition. No wonder so many wine tourists make there way here each year (click here to take a virtual tour right now). Congratulations to the Felix Solis group, one of Spain’s most important wine companies, for creating this small treasure, which seems to tick all the UNWTO boxes so well. A completely different experience at Abadia Retuerta and its associated hotel LeDomaine, which are located just outside the Ribera del Duero zone (Vega Sicilia is just down the road, so it is a good neighborhood). This is a very ambitious luxury wine tourism project of Swiss pharmaceutical group Novartis. The hotel, with its Michelin-rated Refectorio restaurant, is housed in a restored 12th century monastery, which Spanish friends tell me was in ruins before the project began. The careful restoration preserved a sense of the place while upgrading amenities (including a spa) to appeal to luxury wine tourists. The chapel feels like what it once was and the cloisters have that quiet sensibility that makes them special. The restaurant is in the old refectory and makes dining there an experience that is about more than food. Sue and I enjoyed one of the set dinner menus that sought inspiration in local ingredients and traditions. We got very lucky on the wine as the Novartis board had met there the day before and we helped finish off some of the magnums that they had enjoyed with their meal. It is hard to stop thinking about the hotel and restaurant, but the wine side is special too. The wine tourism experiences are mainly organized around the various old vineyards with e-bike, horseback and 4×4 transportation modes all available. The total package — vineyards, winery, hotel, restaurant, and spa — is quite spectacular. A tip of the hat to Novartis for seeing the potential of this place making such an important investment in the wine tourism future of this region. We left Abadia del Retuerta and set our gps for Elciego in the Rioja region, stopping along the way in Burgos for lunch and a tour of the famous cathedral. Our destination was Marqués de Riscal, the oldest wine producer in Rioja, and its famous hotel, which rises above the winery at the top of the hill. The main hotel structure was designed by architect Frank Gehry, all bright colors and unexpected angles. Most of the hotel rooms and the spa are found in a more conventional building adjacent to the Ghery structure and over-looking a vineyard block. It is quite a place and, in a funny way, its sharp contrast with Spanish tradition serves to bring out some of the features of the small village on the other side of the road (especially the church, I think). Down the hill from the hotel you find the historic winery, which produces 10 million bottles of wine a year (65% for export) and receives about 80,000 visitors. Wine tourism is well organized here with a large public relations staff and an excellent program that takes visitors from the original 1858 building on through the winery ending at bright and colorful tasting room and gift shop area. The brief video that summarizes the main messages of the winery and tour was one of the best of its type we have seen. We got a real sense of Rioja wine history at Marqués de Riscal, a winery that lives up very well to the goals of the UNWTO wine tourism initiative. It promotes wine, but does much more, creating jobs in the hospitality industry, drawing attention to the region, its culture and history. That’s what wine tourism today is all about. Thanks to Susana and FEV for inviting us to Spain and to everyone who welcomed us to Pago del Rey, Abadia del Retuerta, and Marqués de Riscal. Come back next week for three more case studies of wine tourism in Spain. Sue and I recently returned from the United Nations World Tourism Organization’s (UNWTO) first Global Conference on Wine Tourism in Tbilisi, Georgia and we are still processing the experience. The conference opened with a gala dinner (hosted by Georgia’s Prime Minister Giorgi Kvirikashvili) at the beautiful Funicular Restaurant, which is located high on the hill overlooking Tbilisi next to the television tower. The view from the patio was spectacular (see Sue’s photo above), especially as the sun went down and the lights came up, highlighting the monuments. It felt like you could reach out and the touch the city. The gala dinner at the scenic restaurant was a reminder that wine tourism is first and foremost tourism and it is generally a mistake to think of it out of the context of other tourism opportunities. There will be some who will come to Georgia just for the wine, but most will be attracted by the complete package — sights, sounds, culture, people, food and so on with wine playing a larger of smaller part in each case. The dinner was a great introduction to Georgia’s best and a good lesson that wine tourism is most effective when it is embedded in the broader context. We loaded into coaches the next morning and headed east toward Kakheti, the main wine region and the location of our first meetings. We stopped at the historic Alaverdi Monastery, were wine has been made using the traditional qvevri method since 1011. We toured the monastery, visited the marani cellar with its qvevri vessels, and tasted one of the wines, a complex golden Rkatsiteli shown below. After the tour we adjourned to a cafe where we had coffee and cups of delicious matsoni (local yogurt) with local honey and walnuts (a fabulous combination). The wine tourism here was seamlessly integrated into the cultural elements and featured local food products and the opportunity to purchase traditional crafts, too. A great tourist and wine tourist stop. And this is not an accident. Georgia correctly sees tourism as an economic development opportunity, especially in rural areas like Kakheti. The Georgian government has worked to develop tourist infrastructure and marketing strategies in partnership with international development organizations including the World Bank, EBRD and USAID. The Alaverdi Monastery is an example of how these efforts have come together successfully to leverage history, culture and wine to create real opportunities for local workers and producers while giving tourists a memorable experience. If the monastery is a good example of adapting something quite old to create a wine tourism experience, our next stop showed a more contemporary touch. Khareba Winery offers a focused wine tourism experience built around a huge network of tunnels that date from Soviet days. The tunnels were reportedly built with military use in mind before eventually becoming a regional wine storage facility and now a wine tourist attraction. Our afternoon conference session was held up at the Saperavi restaurant with its great view of the valley and then we walked down the hillside to the tunnel with its exhibits, wine tasting, and a group of polyphonic singers who filled the underground space with sound. The tunnels are a noteworthy attraction, but there was more. A path meandered through the park-like grounds and along the way the visitor is offered the chance to bake bread in a traditional clay oven, watch chacha being made (and taste some, too), make churchikhela, which are strings of nuts dipped in concentrated grape must. A moveable feast was laid for us along with path with traditional dishes, including mountain trout and spit-roasted meat. As at the monastery, the experience was orchestrated to create a complicated sensory experience filled with sights, sounds, smells and tastes mixed with a strong sense of Georgian culture. Wine was at the center of the experience, but there were many threads interwoven here. Chateau Mukhrani, the conference venue for the final day, was built in 1878 and, as the vintage image suggests, it resembles a French chateau to a certain extent. The likeness has been heightened by recent upgrades aimed at enhancing wine tourism. The reaction of some of the international conference participants was noteworthy. What is a French chateau doing here? Why isn’t this winery made along traditional Georgian lines, like the monastery, for example? 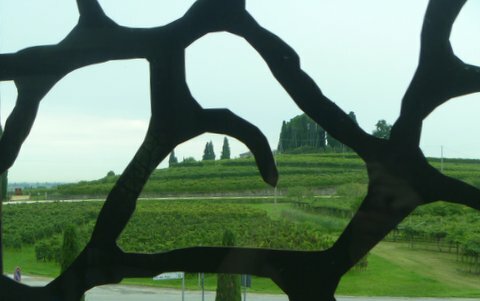 The winery’s architecture, which most visitors will find appealing, was a turn-off to those seeking greater authenticity. So why the disappointment? I think it is a example of something that I call the “globalization paradox.” We love globalization because of its ability to bring things from all around the world to our towns and cities. Good espresso, authentic wood-fired pizza, designer shops — it is great to have these things nearby creating a cosmopolitan local environment. But there is a downside. Everyone wants these things and for the most part they get them. This means that when we travel abroad we see many of the same things we already have back home and not the quaint frozen-in-time images that we expect. Globalization makes the local more diverse and interesting, but the foreign is rendered less exotic and disappointingly more like home. Sigh. Do you see how a French chateau in Georgia fits this pattern? It definitely adds to the wine tourism experience in Georgia, even if it takes away a bit from the experience that the seasoned international traveler may be seeking. This video will give you a sense of Chateau Mukhrani and how it has been designed to serve as an attractive wine tourist destination. It is good to remember that wine tourists are a diverse group and a great many of them will enjoy visiting a chateau … even if they do it in Georgia, not Bordeaux. How did the conference’s experimental format work? As you might expect some venues worked better than others for particular purposes. And I am not sure that everyone realized that we were both discussing wine tourism and practicing it at the same time, meaning that some teaching moments were probably lost. But I applaud experiments like this and hope the organizers continue to innovate at next year’s UNWTO meeting in Mendoza, Argentina. A quick shout-out to George Piradashvili and the staff at Chateau Mere, where we stayed during our brief tour of Kakheti after the conference. Chateau Mere is a good example of how wine tourist infrastructure can be creatively developed to serve diverse visitor needs. Personal thanks to George for sharing his great food, fine wine, and Georgian wine business insights with us.